A group of activists taking part in a march for Aleppo arrived in Bosnia-Herzegovina's capital Sarajevo on Wednesday. The Civil March for Aleppo was organized by activists in Berlin to march to Aleppo, Syria in order to end the bombing in the country and deliver humanitarian assistance to civilians. The 35 marchers first visited Sarajevo's Vrbanja Bridge, where Suada Dilberovic and Olga Sucic, the first victims of the Bosnian War, were killed in 1992. Later, the group came to the Eternal Flame, a memorial to the victims of World War II. 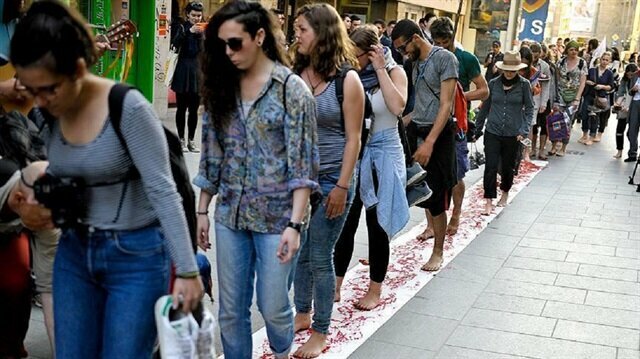 Members of the group then painted their feet red and walked along Ferhadija Street. Polish journalist Anna Alboth, who led the movement, said she had followed the situation in Syria from Berlin before deciding she had to take action. "I couldn't sleep for days and then told my friends that we should do something for Syria," she said. Alboth said that more than 3,000 people followed them in the countries they have trekked through to date and the Syrians they met along the way expressed their appreciation. Alboth added that Bosnia-Herzegovina understands the situation of people living in Syria very well. Brazilian Edgard Raoul, one of the marchers, said that in 2015 he traveled from Turkey to Europe with asylum-seekers. "I went from my Lesbos [Greece] to Frankfurt and I stayed in the same places they did and I ate what they ate," Raoul said. The marchers arrived in the capital Sarajevo after trekking through the Czech Republic, Austria, Slovenia, and Croatia. They are expected to continue through Serbia, Macedonia, and Greece -- the so-called "Balkan Route" -- to reach Syria via Turkey in September. The activists started their journey in Germany last December.